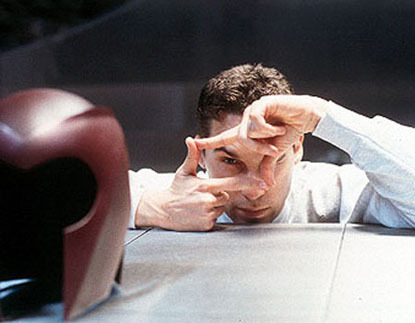 Jonathan Crocker » Blog Archive » Bryan Singer: Magneto and Supes 2? Navigation: Weblog / Blog article: Bryan Singer: Magneto and Supes 2? Aliens and alienation, movies and misfits, it was a love affair that lasted. But Singer didn’t read comic-books. Definitely not X-Men comics. With high-school friend and screenwriter Christopher McQuarrie, he immediately emerged as a striking new director of dark, adult thrillers. His dark debut Public Access won the Grand Jury Prize at Sundance. His follow-up The Usual Suspects won two Oscars and instant cult-classic status. Most fans would agree. Back in 2000, Singer’s X-Men cut a new template for superhero movies and mutated into Hollywood’s longest running modern comic-book franchise. Singer even broke the sequel curse by deepened X2 into an even more textured, emotional triumph. But during jagged negotiations over X-Men: The Last Stand, Singer left to rejuvenate Superman Returns , leaving Rush Hour director Brett Ratner to churn out a very Hollywood X-threequel: noisier, clunkier and less heartfelt. But this is what make Singer’s movies kick: people. He’s something special, an actor’s director disguised as a blockbuster maestro. He’s drawn Oscar-winning performances from classy thesps (Kevin Spacey in The Usual Suspects), turned unknown character actors into iconic superstars (Hugh Jackman in X-Men) and moulded rookie TV actors into blockbuster heroes (Brandon Routh in Superman Returns). Few remember that Singer almost directed Confessions Of A Dangerous Mind with Johnny Depp. Or that he directed the pilot for US TV’s hit medical-drama House . Or that an exhausted Peter Jackson asked him fly to New Zealand to direct the final few shots of King Kong . Claims that Singer craves a return to his roots miss the point. Every movie has been personal. Every movie has been about characters who’ve lost their roots. Not least Superman, whose tale of a lost orphan chimed with the director just as ET had so many years ago. With Valkyrie finally finished, Singer was meant to jump directly on to his eagerly awaited Supes sequel. The story was locked down. Filming was slated to start in 2008. Singer was raring to “go all Wrath Of Khan on it”. Then… nothing.